Matt and Rowan Hellyer WeDoAdventure Bosnia Herzegovina blog. I love helping people to creative firsts; I don’t particularly enjoy spending money. When I do spend I want to know it’s been money well spent. A couple of months back I started e-begging for guitars. It was fantastic when we started to see donations coming in. But then came the responsibility to see that cash was well invested. After talking with some of my students I decided we needed to get an electric guitar and amp, along with new acoustic guitars. I’m going to claim that was a very inspired move on my part! 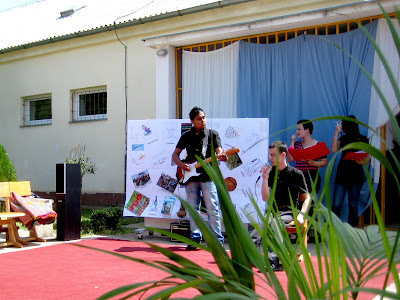 You can see the guitar pictured here, being played by one of our students during a concert at his school. He had two spots on the bill. The other spot, which I tragically forgot to photograph, had him playing guitar while a fellow student recited a poem. Together they recently won a generous cash prize with their creation, coming first in a talent show for high school students across the canton. As one of their teachers excitedly explained, it was the first time anyone one from their school had one anything in a competition like this. He was so thankful we lent him the guitar for the concert; I am so thankful people like you made that possible. This is just the beginning. He will be playing at a concert in Klub next week, as part of a band drawn from our music course students. It’ll be a first band performance for all of them. I’m confident it’ll inspire many others to get creative. And I won’t forget to take photographs this time! As we write this it is less than a month to the ten year anniversary of us climbing into a Transit van to drive across Europe to start our adventure in Bosnia and Herzegovina. A lot has happened since then. So much we could write a book about it. We haven't written a book but we did push the boat out and make a booklet highlighting ten key things we've learned over the last decades. While supplies of the physical booklet are limited you can grab as many copies of the pdf version as you like! Rowan read that Mostar police had to use tear gas to disperse revellers after the football on Wednesday night. They could have been celebrating Bosnia Herzegovina’s win or Croatia’s. You could have followed either game here depending on which cafe bar you chose. That sort of painting the town is achievable with a lot more spontaneity than the literal kind. This we discovered today when we went shopping for paint. We moved to Mostar, Bosnia and Herzegovina, to work with Novi Most in September 2008. In October 2010 we left Mostar for Jajce. As we reach ten years of adventure in Bosnia and Herzegovina we have our story to tell. It may not be the story you hear on the news, or the one you hear from other people. But it is what we’re living. It’s our experience. You get the story when you go. This is our story. Thanks for visiting WeDoAdventure!